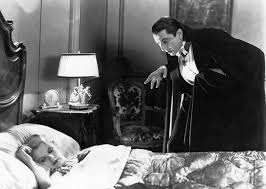 The local cinema was showing a Turner Classic Movie Dracula double feature: Tod Browning’s 1931, black and white version of Dracula, and the 1931 Spanish version of Dracula. Of course there was no question; I was going to attend the event. I’ll be honest: I brought my trusty notepad with me, and I tried to scribble some comments in the pitch black theater while I was watching Bella Lugosi prey on the necks of fair young maidens. Now I love a good black and white movie, if done well. The 1963 version of The Haunting is one of my favorite horror movies, and I’ve been dying to see The Innocents. But I’m hesitant to say that I’m a huge Dracula fan. Don’t get me wrong – I enjoy seeing Bella Lugosi arch his eyebrows – but something about the film seemed incomplete. The script was catchy, with quotable lines, but Browning’s film lacked the character development I find central to a truly well-made film.